Celtic have hired consultants to carry out an independent review into events leading up to fans being crushed outside the club's stadium. One person was taken to hospital and four more were injured before last Sunday's match against Rangers after stadium access points were changed. The club has already apologised to supporters for the situation. Fairhurst, a company specialising in sports event safety management, will conduct the review. The consultants will also be asked to recommend improvements to avoid a repeat in future. Fans will be able to provide feedback through a special email address. A Celtic statement said: "Following the events prior to kick-off at the match on Sunday 2 September, the club has instructed Fairhurst, consultants specialising in sports event safety management, to conduct an independent review to identify the contributory factors to the incident, any issues that require to be addressed and what improvements might be made to prevent a recurrence. "The club has requested that Fairhurst consider feedback from supporters who attended the match. "Any supporters who attended the match and would like to provide information to Fairhurst, please do so direct to 020918feedback@fairhurst.co.uk. Any information already provided to the club will be passed on to Fairhurst." After the incident, Police Scotland also promised a "thorough and comprehensive" debrief of the policing and stewarding operation. Police held what they described as a "constructive" talks with officials from Celtic on Tuesday. Ch Supt Brian McInulty also said he would meet with fans' groups to discuss their concerns. Celtic said the match was the first occasion which featured new segregation and access arrangements for the Old Firm fixture. 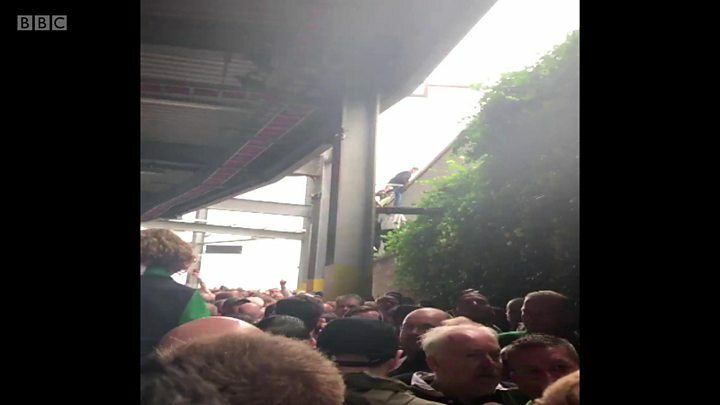 Some fans said the new plan resulted in some supporters being forced to climb over a high fence to escape the overcrowding, with one falling from a wall.